William C. Bissell & Marie-Aude Fouéré (eds. 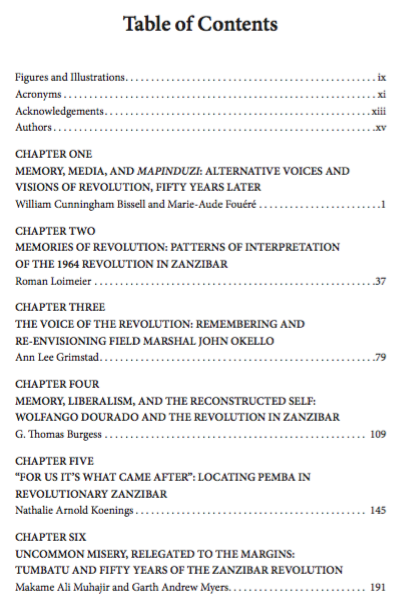 ), Mkuki na Nyota Publishers, 2018, 404 p.
This volume focuses on the cultural memory and mediation of the 1964 Zanzibar revolution, analyzing it’s continuing reverberations in everyday life. The revolution constructed new conceptions of community and identity, race and cultural belonging, as well as instituting different ideals of nationhood, citizenship, sovereignty. As the commemoration of the 50th anniversary of the revolution revealed, the official versions of events have shifted significantly over time and the legacy of the uprising is still deeply contested. In these debates, the question of Zanzibari identity remains very much at stake : Who exactly belongs in the islands and what historical processes brought them there ? What are the boundaries of the nation, and who can claim to be an essential part of this imagined and embodied community ? 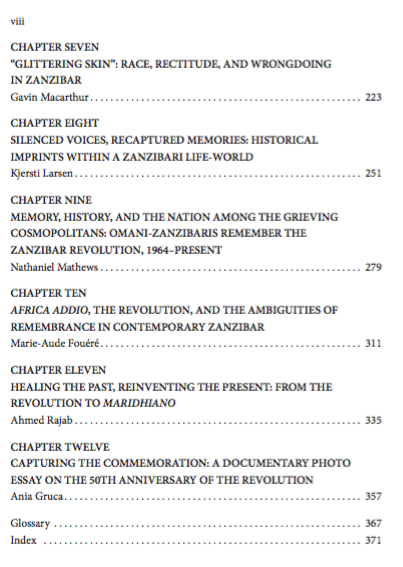 Political belonging and power are closely intertwined with these issues of identity and history—raising intense debates and divisions over precisely where Zanzibar should be situated within the national order of things in a postcolonial and interconnected world. Attending to narratives that have been overlooked, ignored, or relegated to the margins, the authors of these essays do not seek to simply define the revolution or to establish its ultimate meaning. Instead, they seek to explore the continuing echoes and traces of the revolution fifty years on, reflected in memories, media, and monuments. Inspired by interdisciplinary perspectives from anthropology, history, cultural studies, and geography, these essays foreground critical debates about the revolution, often conducted sotto voce and located well off the official stage—attending to long silenced questions, submerged doubts, rumors and secrets, or things that cannot be said. William Cunningham Bissell is Professor in the Department of Anthropology and Sociology, Lafayette College, Easton, PA. He has written widely on sociocultural processes in Zanzibar and the Indian Ocean world, with a specific research focus on urban transformation, representation, memory, and media in diverse contexts, including the anthropology of nostalgia and the reimagining of the revolutionary past. His first book, Urban Design, Chaos, and Colonial Power in Zanzibar (2011), focused on the failures and contradictions of modernist colonial urban planning, while his current ethnographic work centers on transnational media, urban image-making, and the contested politics of contemporary African film festivals. Marie-Aude Fouere is a Lecturer in Anthropology at the Ecole des hautes études en sciences sociales (EHESS) in Paris and was the Deputy Director of the French Institute for Research in Africa (IFRA) in Nairobi (2011-2014). Her first book was on joking relationship in Tanzania (L’Harmattan, 2008). 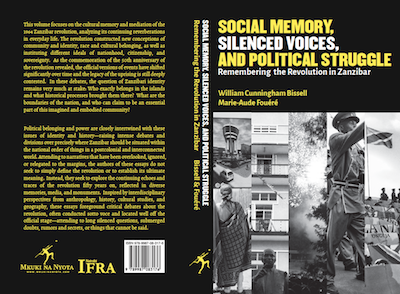 Her current research interests cover collective memories, belonging and the use of archives in contemporary Tanzania, focusing on the figure of Julius Nyerere and the Revolution of 1964 in Zanzibar.